Where are you currently a student? I’m currently a Senior SRNA in the Kaiser Permanente School of Anesthesia (KPSA) Class of 2017. What is the most rewarding experience of training thus far? I’ve found regional anesthetic rescue blocks to be the most gratifying service we can provide. It is a very humbling experience to see a patient writhing in pain to then having their pain be almost immediately alleviated. How do you deal with the stress of school? Two things that I find particularly relaxing are sitting at the beach and playing the drums. They’re reminders to me that the stresses of CRNA School are only temporary. 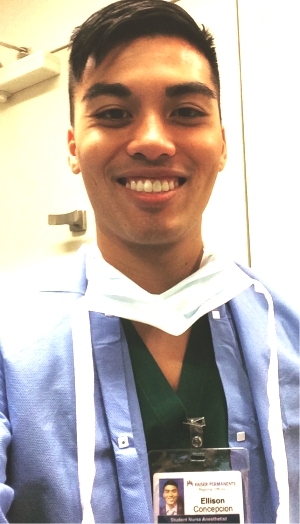 What/Who inspires you to keep pursing becoming a CRNA? My family keeps me motivated to keep powering through the rigors of the program. It’s also very rewarding to see patients wake up comfortably and so thankful for what we do. What is your favorite anesthesia specialty? My favorite anesthesia specialty is Regional Anesthesia. I love seeing patients have surgery with such fewer side effects and far lessened pain postoperatively. I also really enjoy appreciating the anatomy while performing nerve blocks. Is there any research, thesis, practice projects, missions, or other anesthesia related work you would like to share with our community? I’ve been reading about opioid free anesthetics involving preemptive, regional/neuraxial, and multi-modal analgesia in light of efforts to promote ERAS and I think it is very interesting and so beneficial for our patients.